By Dale Johnson Posted: March 13, 2017 3:30 p.m. 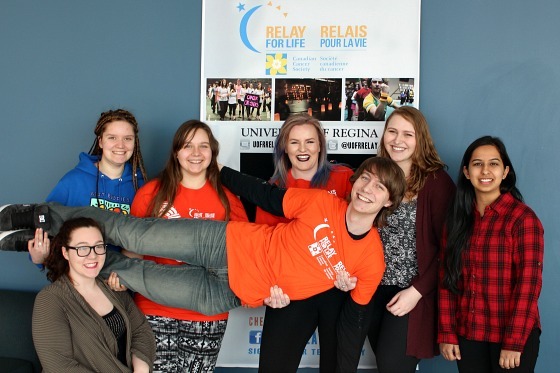 The University of Regina’s Relay for Life is being held later this month and registration is underway this week. Funds raised will go be used for cancer research and support programs in Saskatchewan. Megan Cousins and Melanie Chodak know what it’s like to have their lives touched by cancer. The two co-chairs for this year’s U of R’s Relay for Life use their personal experiences as the main reason for getting involved with this event. In 2012 Cousins' uncle was diagnosed with cancer. Chodak first got involved with U of R Relay for Life in 2014 as a committee member after three family members were diagnosed with cancer as she was growing up. “Cancer is a horrible disease, it has taken many loved ones away from my family," says Cousins, a third-year social work student. "Relay for Life is an event where you get to remember the ones you have lost and stand by those still fighting. It is a chance for students to come together and find strength knowing they are not alone,” she adds. The U of R Relay for Life is a 12-hour, overnight non-competitive relay with teams of five or more team members. The event is scheduled for March 31 and April 1 from 7 p.m. to 7 a.m. at the Centre for Kinesiology, Health and Sport (CKHS, Gym 3). Money raised at the event goes towards the Canadian Cancer Society, which funds cancer research and provides information and support services for people living with cancer here in Saskatchewan. This event includes many exciting activities and entertainment throughout the night with new events such as glow yoga, back to back pound fitness sessions, comedian Haris Khan, and a very popular catered midnight lunch by the Keg South along with new and inspiring speakers at our survivor lap and luminary ceremonies. Relay for Life organizers are expecting over twenty teams to register for this event, with early bird prize draws for teams that register by 8 p.m. this Wednesday, March 15. The Relay for Life organizing committee has registration tables set up all week throughout the campus including: Tuesday, March 14, 9 a.m. to 2 p.m. at the Education Lounge, and Wednesday, March 15, 10 a.m. to 2 p.m. in the Riddell Centre across from the food court. Please visit here to register your team for this event. For more information, please contact Megan Cousins or Melanie Chodak, U of R Relay for Life Co-Chairs at uofrrelay@gmail.com or on Facebook at U of R Relay for Life or on Twitter @uofrrelay.